This Double End-Scraper was found on the Termo-Pialat site in southern France. This Upper Paleolithic Aurignacian site is located in the Couze Valley in the Dordogne region less than a mile west of the now famous Combe-Capelle site. The Aurignacian is known for its heavy use of stone tools made from blades driven off prepared cores. This is an excellent example of a blade tool from the Aurignacian stone tool complex. It was evidently not used very much. There are no signs of heavy use wear and except for the initial trimming of both ends, it was not resharpened from use. Both ends and approximately three fourths of one edge have been trimmed with small pressure flakes. 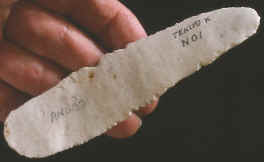 This blade tool would have been used for either scraping or cutting. 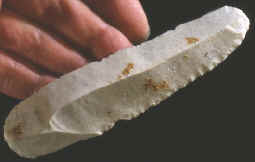 It was made from a very good quality white chert and measures 4 ¾ inches (12cm) long and 1 3/16 inches (3cm) wide. 1973, "Le Malpas Rockshelter", by Anta Montet-White. 1988, "Encyclopedia of Human Evolution and Prehistory", by Ian Tattersall, Eric Delson and John Van Couvering.